As I am writing this I can hear the Good Year blimp flying overhead and the faint sound of bands in the distance. I live 2 and a half miles from the Rose Bowl and 2 miles from the starting point of the Tournament of Roses® Parade in Pasadena, California. People from all over the country have just witnessed the 2017 parade from the bleachers along Colorado Blvd or on T.V. This year it was chilly and damp. The cold is great for keeping flowers fresh but a challenge for keeping my fingers warm and flexible for sketching. I had on three layers, scarf and gloves. The temps were in the 40’s. I admit that’s not cold as other parts of the country, but cold for me. 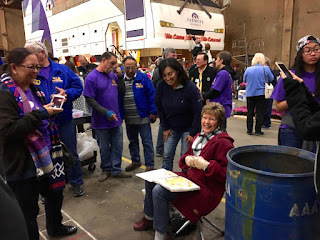 As usual Judy and I had to get permission to be on the floor of the float building site. Even through I’ve sketched the floats since 2001 I don’t want to take for granted the wonderful opportunity I have been given. Once inside the building you'd be surprised how noisy it gets. The P.A. system making announcements, power tools, blenders, scaffolding being move, Crew Chief's shouting directions…and tour groups walking by. First thing I do is walked around the inside of the float building barn. People look like ants climbing all over the floats. They’re glueing on the flowers, seeds, and spices. Others are cutting apart straw flowers, sticking roses into vial with water, sweeping the floor, moving scaffolding... The energy in the building is magical! The challenge is finding a view that is exciting to sketch, unobstructed and not in the way. This isn’t easy! There is so much going on. Once I found a good spot I had to constantly move, duck, lean, and dodge. And on top of all this everyone who walks by is interested in what I’m sketching. And I loved every minute. 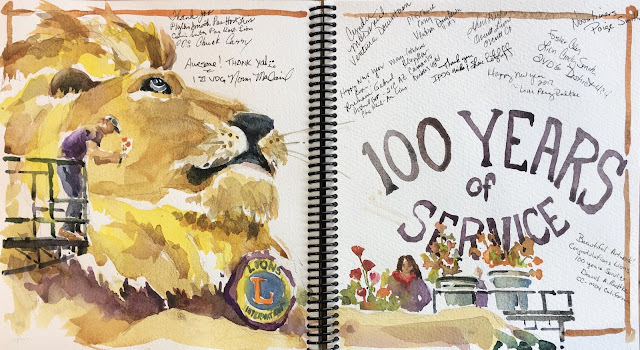 I sketched The Lions Club International float,“Celebrating 100 Years of Service”. 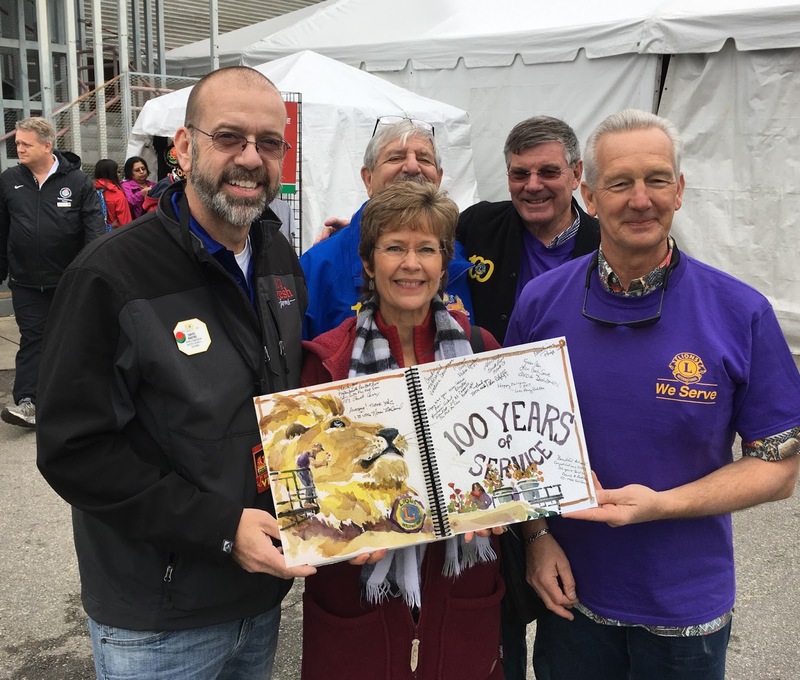 The organization does a tremendous amount of work to help people all over the world. I asked the volunteers working on the float to sigh my sketch. As it turned out many of the top district leader were on site and I had a photo opportunity with them, too. What fun! The parade was on January 2nd. I imagine a few are shaking their heads and wondering why the Tournament of Roses® parade didn't happen on New Year’s Day. In 1893 a “Never on Sunday” tradition was established. Any year New Year’s Day fell on a Sunday the parade would be moved to Monday. Why you ask? To avoid frightening horses that would be hitched outside churches and interfering with worship services along Colorado Blvd. So the events were moved to the next day, January 2. The tradition remains to this day. How wonderful that you get to sketch this each year! Great job!!! Our children marched in it twice, we are from north cal. We also were given permission to tour through... I remember how bundled up we were!!! Both times freezing!!! Beautiful job!!! You know the expense well! The float barns feel more like a freezer with the cement floors and metal roof. Chilly!!!!! Interesting history. We used to love to watch that parade when the Big Ten winner would play out there that day. What a wonderful tradition! The sketch is great and an even more meaningful remembrance with all the signatures. It does add a deeper meaning to the experience. Happy Sketching! Thanks so much for sharing the wonderful opportunity you had to enter the float building site and do some sketching! That is so special. I did not know about the "never on Sunday" tradition. It's a good feeling to know that tradition remains in place. Hello Brenda! Happy New Year! I've recently become a subscriber to your news letter and have always wanted to meet you at the floats but it seems I missed you again. 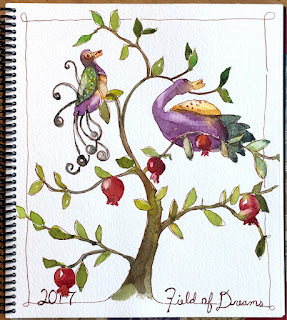 I design floats for Phoenix Decorating Company and love your watercolor interpretations of them. Just a bit of bittersweet news.......the floats moved out of this building (and the Rosemont Pavilion) for the very last time. 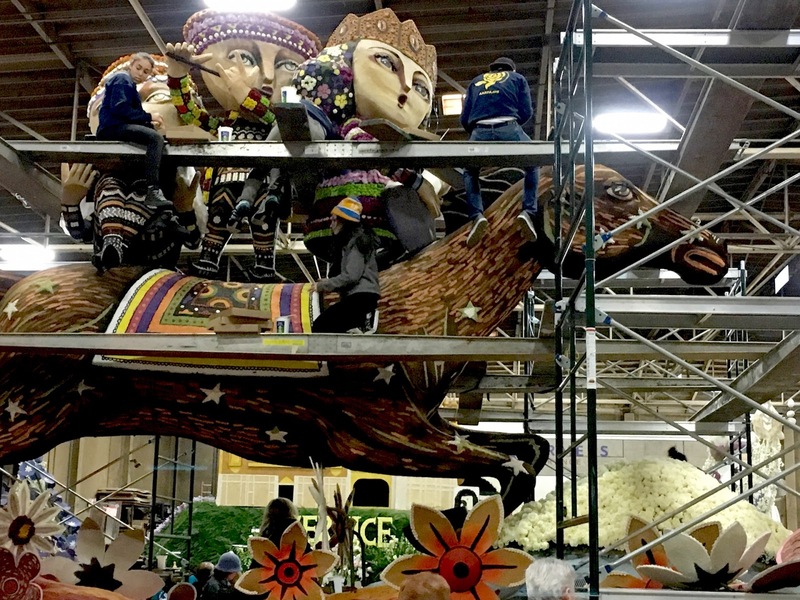 Phoenix is relocating to Irwindale (where other floats are currently constructed) Most of us grew in the Pasadena locations and have witnessed hundreds of floats coming to life there. But nothing stays the same and the time has come to make a move. We have high hopes for the new building site, as it can accommodate all of our floats without having to split them between two locations. This will simplify things greatly. But we will miss being in Pasadena as it has been our home for 30 plus years. We will continue the tradition a few miles east and make the trek to the parade route just as though we never left. Thank you so much to telling about the change of site for the Phoenix Float building barn! I would hate to miss the opportunity to sketch the beautiful floats. 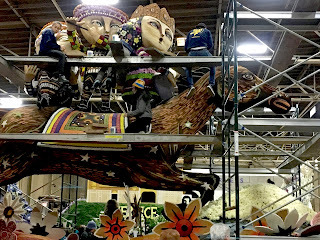 As you know all the activity that goes on around the floats are a highlight to our New Year celebration. Happy New Year! I always look forward to your Rose Parade sketches. Wow since 2001! Amazing. And the reason it was on a Monday was news to me! Thanks for sharing that one. Ginny, I love the tradition of sketching the floats and the history behind it. I saw the parade on TV and this float was amazing. 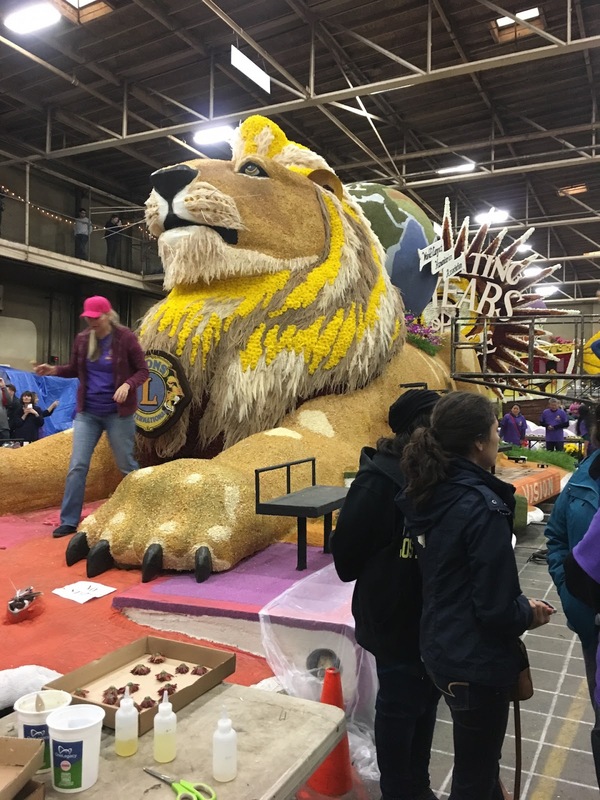 What a fabulous experience for you to be able to witness these floats being bedecked with flowers and to sketch as you do so well. Thank you for sharing this experience through these pics and explanations; but least of all sharing your awesome sketches! Always look forward to seeing them. Thanks you for the sweet words. The real joy comes when I get to share the experience with others. Happy New Year! Very odd, I got an email re this post today 10/15/2018... enjoyed reading it again but thought you should know there's a glitch in you subscriptions maybe.